THE WEATHER WILL remain changeable and unsettled over the weekend but Met Éireann says there is no indication that there will the kind of downpours that led to heavy flooding in some parts of the country this week. A burst of heavy rainfall in parts of the country in the early hours of yesterday morning left parts of Cork badly flooded with the cost of the damage likely to run into the many thousands of euro. As the clean-up operation continues, there is likely to be more rainfall over the weekend with humidity lower than it has been in recent days and more breezy spells with some sunshine. 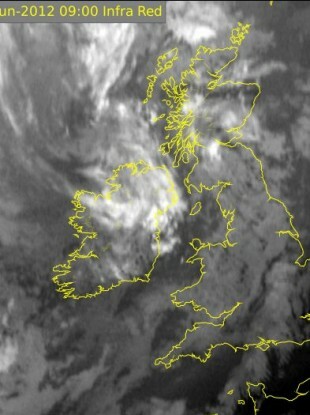 There will be heavy rain in western areas later tonight with cool and breezy spells. That spell of rain from the west will cross the country tomorrow morning and will be heavy in some parts but the afternoon and evening will be brighter. Early next week looks much the same with some good spells of sunshine but a rain expected in parts of Connacht and west Munster, remaining largely unsettled. In the short term there is no sign of the weather picking up, the meteorological office says. There is set to be a spell of high pressure towards the back end of next week but Clarke said it was too early to say what that might bring. “It will mostly be changeable and unsettled for the time being,” he added. Best keep the umbrella and rain jacket nearby then. A full forecast is, as ever, on the Met Éireann website. Email “No more flooding over the weekend but weather to remain unsettled ”. Feedback on “No more flooding over the weekend but weather to remain unsettled ”.